AS of today, I do not have any information on what is being offered in this years Ace Race, but I wanted to start this thread so everyone knows it is happening. August 11th, 2013 at Swope Park. This year will be even more fun with the same flexible start and shorter holes to allow more players the opportunity to get some chains. You can pre-register for $25 at Dynamic Discs Kansas City. Pre-Reg is recommended as it helps us determine how many players packages to order. I'll post more as soon as I get it. Always ready for the Ace Race!! I will most definitely need additional baskets this year. I'll be in touch Mike. My favorite event of the year!!!!!! 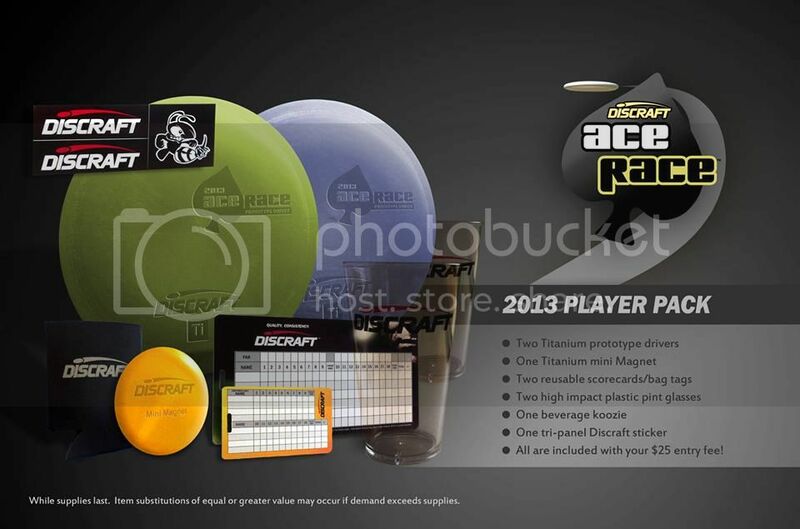 Discraft is now saying the information about this years Ace Race should be on July 22nd. I will let you know as soon as I know. I think attending my first Ace Race ever is in order!! Every player receives a sweet player pack! Two copies of the 2013 Ace Race prototype disc: It's a beginner-friendly distance driver... and it's in premium Titanium plastic! One Titanium mini Magnet: you've never seen one before, since they've never been made before! Two reusable scorecards/bag tags: something else you've never seen before! We commissioned these reusable scorecards just for 2013 Ace Racers. With a pencil and a clean eraser, you can use your new scorecards for round after round. The first one is credit card sized... keep it in your wallet and you'll always have a scorecard ready to go. It also makes a cool bag tag! The 2nd reusable scorecard is larger for easier use and up to six rounds of 18 before it needs erasing. The flipside has the complete 2013 Discraft flight chart for easy reference anytime. Stash it in your back pocket, in your bag, or use the punch hole to hang it wherever you like. We're also including a pencil with eraser with your Ace Race player package, so you can start using these cards right away. Two high impact plastic pint glasses: very cool! One beverage koozie: silver on black, jack. One tri-panel Discraft sticker: three stickers in one. OK, that actually interests me. Can these glasses be used the following weekend at the Non-tournament disc golf event at another park in the same city? My favorite package items so far besides the discs was the key chain and the full color mini. This package is pretty neat.